Yellow stains. The seemingly unavoidable remnants of a stressful day that bring quick death to your favorite dress shirts and T-shirts. Or maybe you've learned your lesson the hard way and avoid light-colored dress shirts altogether. After all, replacing shirt after shirt adds up fast. The worst part is that you don’t always realize you need a solution to yellow stains until they’ve inhabited your most expensive shirt. At that point, you have one shot to salvage it. If the yellow stain doesn’t let up, it's likely there for good. Sweat isn’t the only one to blame for your yellow stains. When the aluminum from your antiperspirant mixes with the proteins in your sweat, they create the yellow tint often associated with sweat. To get rid of yellow stains, you could nix the antiperspirant, and switch to an all-natural deodorant instead. But if you sweat excessively, deodorant may not be effective. In this situation, use antiperspirant judiciously to limit the potential for yellow marks. Soaking your clothing in vinegar and hydrogen peroxide can curb the onset of yellow stains. But if these household products aren’t doing the trick, try submerging your sweaty clothing in OxyClean for about 20 minutes prior to washing or generously applying Raise Armpit Stain Remover to the stain. To eliminate stubborn yellow stains from your whites , the bluing effect of Stewart’s Bluing Whitener can also counteract the yellow and get your white dress shirts looking new again. Bleach might be the stain savior for white clothing, but in the face of powerful yellow stains, it actually worsens the yellowing. Resist the temptation to soak your shirts in bleach. After a long day, you might be anxious to change out of your work clothes and relax. So you toss your wet dress shirts in a hamper until your next laundry date and go about your evening. But in doing so, your sweat and antiperspirant have the chance to dry and form unruly yellow marks. Instead, pretreat your sweaty clothes as soon as possible (especially before the sweat dries) to prevent yellowing. By protecting your dress shirt with a sweat proof undershirt, you eliminate the prospect of pesky yellow stains. Thompson Tee sweat proof undershirts have built-in underarm pads that completely block sweat from passing through and stop you from pitting out. When sweat doesn’t reach your shirts, you prevent the possibility of yellow stains forming on your shirts. 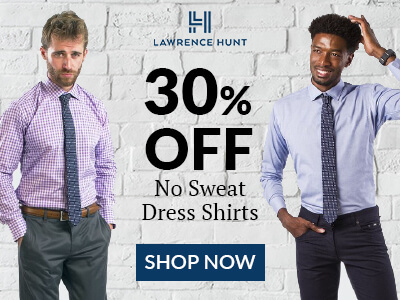 The result: serious savings on undershirts and dress shirts. Sweat pads can block sweat and antiperspirant from marring your undershirts and outerwear with unattractive yellow stains. This solution generally works best for light sweaters. Heavy sweaters will quickly sweat through the pad or sweat shield. To keep the pad in place, you have to constantly readjust or replace it. Adhesive sweat pads can also leave behind a sticky reside, so it’s not recommended to wear these with expensive dress shirts or materials. Don't let sweat stains destroy your clothing and drain your wallet. Follow these tips, and you’ll be prepared to take on even the most vicious yellow stains — or better — avoid them altogether. What tips do you have to prevent pitting out and the formation of yellow stains?